When a professor from the “Working on Peace, Insisting on Justice” workshop I offered in Dali China in 2017 said she wanted to invite me to her university the following year, I thought she was just being kind. Given the considerable responsibilities that Professor Wei carries, as Chair of one of only two Women’s Studies departments in all of China, I didn’t think she would really have the time to follow through. Only she did, as did several of her colleagues who, behind the scenes did much of the necessary negotiating to make my visit as a scholar-in-residence possible for May 2018. Now two days before leaving, I am already missing this special place, so grateful for all the people that opened their minds and hearts to me here. China Women’s University has a unique history, as one of the universities sponsored by the Women’s Federation in China charged with teaching all first year students about the foundations of women’s studies and supporting the development of a premier women’s studies department. A relatively small university by China standards, it enrolls about 4000 undergraduate students each year, almost all of whom are women, as well as graduate students coming from several countries in Africa and the Caribbean (Malawi, Zimbabwe, Chad, South Africa, Ethiopia, Jamaica) who are studying social work. My responsibilities included offering five guest lectures, that turned into eight as we saw that it helped for me to come into the same class more than once. I also gave a university talk and a series of faculty seminars on feminist pedagogy. 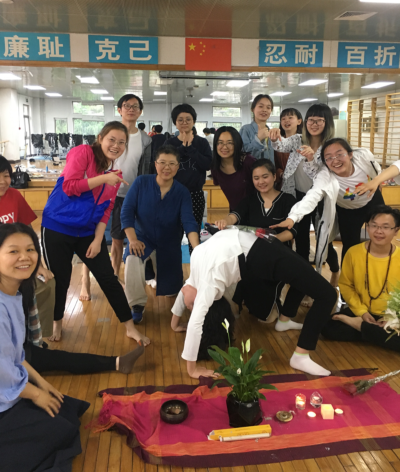 Along the way, we added in a three-day writing and yoga workshop for faculty and students at the university as well as community workers in Beijing. 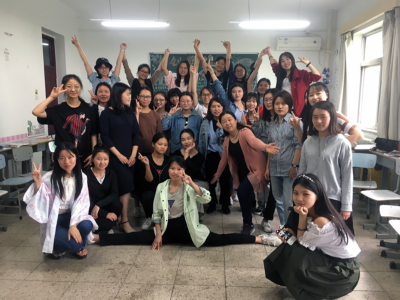 I came to the university with only one previous experience in China when several feminist scholars and community workers organized a way for me to offer “Working for Peace, Insisting on Justice” workshops in Guangzhou and Dali. I had never been to Beijing or to China Women’s University. I came worried that I would be lonely, staying by myself in a dorm, not knowing the language, the rhythm, the culture of the university. When I learned a couple weeks before I arrived that I was assigned students who would help me get settled, I had no idea that four weeks later I would be so attached to Jiang ZiWei and Cui QiJia, that I am already plotting about how I can get them to visit me in the US before they have graduated. Was it their downloading the most extraordinary combination of Chinese popular songs onto my IPod so that I could learn and then teach yoga dances to Li Jian’s “Wind in the Rye” and “Desert Chang’s “In a Day”? Or was it their staying up for hours to translate Audre Lorde’s “A Litany for Survival” and Pat Parker’s “Love Isn’t” so that we could include those poems in the poetry packet for the writing workshop? Or was it their being willing to write notes to taxi drivers so they would know where to take me since the extent of my Chinese is good morning, thank you, vegetarian, excuse me, and Tai chi? Or was it their coming to my university lecture with all of their dormmates and friends, beaming at me as I spoke about hope as the color of purple we can celebrate by supporting feminist work transnationally? Was it their taking me to their favorite karaoke palace, a high rise building where small groups of people rent strobe-light equipped rooms with huge video screens so they can sing Chinese and American song to each other for hours? Or was it their waiting until I was finished with faculty seminars and then taking me to a restaurant that has the best dried green beans I have ever tasted? Or was it their willingness to get the supervisor at the gym to open up a room for table tennis so I could whack the ball around with them for hours after finishing the three-day poetry and yoga workshop? I could go on…. but meeting Cui QiJia and Jiang ZiWei is one of those moments where I feel led to people. What are the odds that we could find each other, and know this is the first of many adventures together in this life? About my worry about being lonely in the dorm…well it turns out I was placed in the dorm where many of the international students stay for two years when they are here from multiple countries in Africa. Technically they are “students” except they come as NGO workers, entrepreneurs, radio commentators, gender equity workers, mothers, wives—leaders in their communities coming to further develop their advocacy for women. This is the group that asked me to teach them “yoga” at 7:00 in the evening, on a running track full of people playing volleyball, basketball, jumping hurdles, and stretching out. Not exactly a space created for yoga, as we rolled out mats just to the side of the track, on the edge of the volleyball court as errant balls came whizzing by. Somehow we created a magical protective bubble around us, finding a way to go deep into an hour and a half practice, moving to India.Arie and Angelique Kidjo, chanting Yemanya Assessu, the goddess of the ocean, laughing hysterically when someone landed crow and then did not. We laid around almost on top of each other after for photos, practicing headstands on the track. At the center of this group is Gloria Mungomo, a thirty-seven-year-old woman from Malawi who had been working as a radio broadcaster for the empowerment of women. Her thesis at China Women’s University is on what makes radio work for women. Gloria, who lost her mother this year, made a commitment to her mother’s spirit by rising at 5:00 am to run up and down the formidable library stairs ten times, jump rope 500 times and then walk the track. With this routine she hopes she can side-step the diabetes and high blood pressure that stole her mother. Gloria is who took me to two Chinese markets, bargaining like I have never seen anyone bargain, in her clipped English, determined to get me a new backpack after announcing that mine had died, that it was an embarrassment to me and all those around me. Gloria and her friend Loveness Nkunika took me to their Christian Church in Beijing, a huge auditorium where people have to show their IDs to get in. No one from China is allowed in even as people from all over the world are permitted entrance. Life in this global age… when those from inside the country are not allowed in someplace even as outsiders are permitted. You might ask, why the government makes this arrangement? Is it easier to contain religious observance if it is closely monitored in a lone central location than practiced in hiding in neighborhoods? Might it be part of China’s humongous investment into several countries in Africa? I came to Beijing hoping to see the Forbidden City and Tiananmen Square and museums. But I am really appreciating the small every day life here at the university, feeling like I am part of the culture rather than studying it. I stick out as a curious westerner wandering around but clearly the school has had many guests over the years. Students who came with me for bo bo cha cha dessert said they had never eaten a meal with a professor before. They wanted to know what I thought of women who want to be housewives? What I think of plastic surgery and arm pit hair? If I could give them a reading list? They said that in some women’s studies classes a focus is on white Western feminist academics. Nothing by Chinese feminist activists. Nothing by Asian American feminists. I brought Dragon Ladies: Asian American Feminists Breathe Fire (whose title I tried to communicate in the middle of the classroom by acting like a dragon breathing fire) and This Bridge Called My Back: Writing by Radical Women of Color. Thirty plus years since its publication, it is still so alive, rich, revolutionary. An essay from there, “A Letter to Ma” by the professor and writer Merle Woo (whose mother is Korean and father is Chinese) was what I assigned for pre-reading in one of the classes. We talked about the contradictions Merle Woo lives with, her complicated relationship to her mother and father. Then, I asked the students to write a letter to their mothers. They focused. They wrote in English and Chinese. They shared in pairs afterward. Crying, laughing, whispering, speaking in loud voices as I talked about Mitsuye Yamada’s famous line, “invisibility is an unnatural disaster.” I wish I had brought a dozen copies of This Bridge Called My Back. It is a big deal that this women’s studies department is only one of two in all of China. But some of teaching methods and curriculum both reproduce white Western gaze. As is true in the US as well. It is so good to be here and only have one job…preparing for and then teaching the classes, workshops and university lecture. I have time to think, feel, prepare. Time to workout or practice Tai chi for two hours in the morning. Time for three easy meals. Time to write. And think and just look at things. Only one job….so refreshing. But juggling jobs in the US is what helped make this possible. Teaching poetry in refugee camps helped to make this possible. My writing helped bring me here. It is good to come here with Teaching with Tenderness which will be the focus of the faculty seminar this week. It is all connected somehow. I keep thinking about the early spring spider web that I saw spread between a fence and a light post on Cape Cod, blowing in the wind. It was so big and fragile and strong at the same time, somehow staying in tact even when the breeze was fierce. At the park around the corner from the university a few men come each morning carrying bird cages covered with fabric that they then hang in the tree and uncover so that the birds can sing to each other. The men sit and watch and listen to the birds. Then they put the fabric back on the cages, lift the cages from their hooks and carry them out of the park. It is as if they are walking their birds each morning. There is a guy at the park each morning who is wearing a kind of bra and pedal pusher sweat pants. He/she is there, in the middle of the park, stretching and kicking. There are a few places you can climb to. Not shrines exactly…just rock formations but they have the feels of a shrine. There is no yoga that I have seen. Tai chi is beautiful. 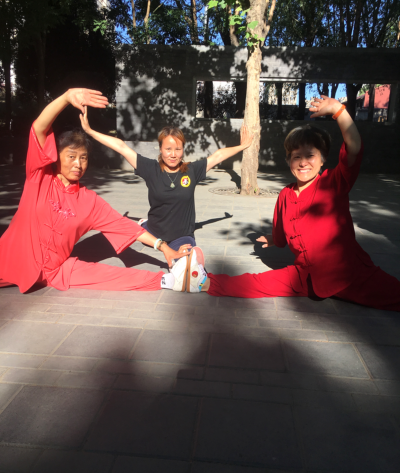 One of the many unexpected gifts on this trip has been being able to shadow long term Tai chi practitioners in the park in the early mornings. I first tucked into the back of the group of people for a half hour, painfully aware of my awkward, stiff movements. The next day I found myself there again, this time staying longer, starting to feel milli-moments of flow and relaxation in my body. Within a few days, I was hooked, staying for the full two hours of their daily practice, mesmerized by the music, the practitioners’ grace, their focus and flexibility. One day, as I walked around the rest of the park on my way home, I noticed that the other Tai chi groups didn’t seem as flowing as the one I had attached myself to, only to learn a few days later that I had unintentionally found myself in a group led by several seasoned Tai chi teachers. It is a wonder they somehow put up with me, those first weeks. 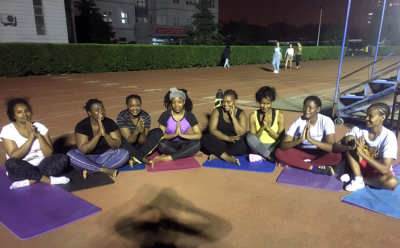 When, close to the end of my stay, they found out I was teaching at China Women’s University and that I teach yoga they asked me to teach them, a request that shocked and intimated me. But I did, first with poses we did in a circle and then with mats. Needless to say it seemed like only a matter of minutes before they could master many of the most difficult poses—bird of paradise, crow, eagle, side crow, dancer—as they laughed their way through the set ups. Women in their seventies were gliding into full splits as I cranked myself down toward the ground looking like the tin man from Wizard of Oz. On my last day, one of the teachers set up a video camera and then placed me behind herself and another teacher, filming a 30-minute segment with me shadowing them so I would have a way to practice on my own. When I showed the video to a senior Tai chi practitioner in the US, his response was that it looked like they were in slow motion. For two hours a day, with a beauty and grace I will never forget. This isn’t to say that this sharing went without incident. About twenty minutes into the yoga class I was teaching, a Tai chi teacher I had not seen before motioned to me, I thought, with approval, only to realize that, in fact, I needed to stop immediately. Although my very limited Chinese kept me from understanding entirely what I had done wrong, I think she thought I was on her turf. And I don’t think she knew I was invited by other practitioners (i.e. I had no insinuated myself there). As I quickly rolled up my mat, I noticed security had already arrived, standing in a menacing way over us. When I used wechat to ask the woman who had asked me to teach how I had offended people, she wrote back in Chinese (which you can translate into English at the click of a word on wechat) that it is not a good idea to “mix sports.” The next day, the teacher who had been angry made a special effort to greet me and took the time and considerable patience to arrange my body in just the right position so we could take a photo together. To me, this scene was emblematic of much of what I saw at the university—a way of solving conflict that begins with someone taking a strong position and then doubling back, reaching out, trying to find common ground. Tai chi in everyday life, push, pull and then steady resolution. As for why security showed up in the midst of it all? Was yoga considered an outside activity that is not appropriate in a park? Does the mistaken notion that yoga is a form of Christianity play a role in the security presence? I am not sure I will ever know. This question about what the government tolerates and doesn’t remains one of the most vexing of queries while I have been here. I was told in no uncertain terms within 48 hours of my getting here that a Chinese lesbian friend of mine was not permitted to stay in the dorm with me. The logic was that no one could stay with me, “for my protection.” But as the weeks progressed, that position seemed to soften to the point that Lu did stay with me during the writing workshop, a big gift. I got precious time with her and she did much work behind the scenes to make the three- day writing workshop happen. Another example of slippage between policy and reality…on the second day of my arrival I was told that I was not to in any way organize lesbian students. I could not meet with lesbian students in public or private and could not go with lesbian students off campus. I heard from multiple sources that the government is serious about squelching any possible gay and lesbian organizing. At the same time, the second week I was here, Hui-chen Huang, the filmmaker of the extraordinary film, “My mother is a lesbian” was invited by the Women’s Studies department to show her film. Surprised that a film with such a title could get into the country, I learn they had switched the name, calling it, “Small Talk,” which is ironic since the film beautifully and painstakingly chronicles the vital conversations between a mother and her daughter leading up to her naming of her mother’s sexuality. That it only took changing the film’s title to get it into the country provides a good example of a key approach to organizing that was eventually explained to me, “Find the cracks in the crevices of the wall and then work in those cracks.” So, brave students at China Women’s University learned that they could not wave rainbow flags, nor are they allowed to meet as a group. So, they gathered in a classroom and painted rainbow flags on their cheeks. And then they painted rainbows on their friends’ skin in the cafeteria. So, no waving of flags….just smiling with rainbow tattoos. Along the way, while I have been here, we learned of a Michigan University faculty member coming to China with 16 students, to Beijing in particular. They had been here for a couple of days when they were escorted out of the country. Why, is unclear. Fast, was clear. We learned that just recently, the government has announced that any NGO that has any public event must register with the police before holding the event. I was required to show all of my speeches, lectures, handouts, and curriculum packets to the women’s studies chair (who is also an official of the government) for approval before teaching. Before I left for China, a Chinese feminist colleague I had recently met let me know that the talk I had written for the university lecture needed to be scrapped—way too political. I had to start over, covering the same ground really, but from a place of poetry and metaphor. In one guest lecture I passed out a series of photographs from a book on the March to Save Women’s Lives in DC, to talk together about similarities and differences in women’s political art in this century. In one class, the students were allowed to keep the photos. In another, the faculty member collected them all, whispering to me that it might be dangerous to let the students keep them. Before I came to the university I was informed there could be no event at the university that involved people from the community. Several days after arriving, I was told that I could offer a three-day workshop that could include five outside participants. Then the number was changed to 10. And then twelve. Two days before the event, a message was sent to the whole wechat group of participants emphasizing that there would be no tolerance for any political discussion during the sessions. If any one intended to have any political conversation, they should drop out. One of the two translators did that, immediately, in protest. Another translator was found. The workshop began and was completed. The yoga seemed to be a great success…lengthy practices each morning with 20-30 people, many of whom got up in early dawn to get to campus in time for class. One of the participants filmed an entire yoga class and has been using portions of it with her work in the community. There was pure joy in the air after the yoga sessions and people seemed to crave yoga being interspersed throughout the writing sessions all day as well. I didn’t think that the free writing sessions went as deep as they had in workshops the previous year….I am guessing because last year, the workshops were not held in academic settings and there was no warning ahead of time that political conversation was forbidden. Or maybe, the writing stayed on a more superficial level because the workshop was so intergenerational and included many people who had never met each other before. Each workshop has its own life, that is for sure. Fear certainly takes many forms. 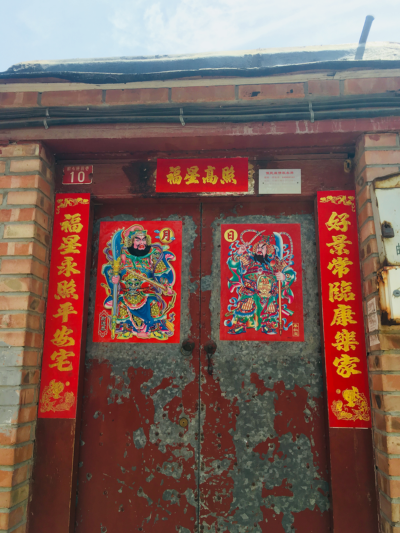 While here, I have been trying to get a sense of how people in China are responding to he who will not be named president in the United States. One of the especially savvy people I know here said that most people approve of him, which baffled me. Then she explained, more important than Agent Orange’s total disrespect for people across the world, it seems is his bullying and strong personality. He has been interpreted as able to hold his own around other leaders like him. This same reliable source explained to me that China wants to be quiet now. Quiet within the country and quiet without. I am left wondering if quiet is part of a strategy so that China can continue to invest in countries all over the world (another example of neocolonialism?). China has become the second biggest economy in the world in less than three decades. Much strategy behind that. Another especially aware person explained to me, “The tiger has been taking a nap. The tiger never forgets you but was not paying much attention to this forest as it was out inspecting other forests. Now the tiger is inspecting this forest again.” So maybe the tiger sees Agent Orange as fairly irrelevant right now. Unresolved questions that I have…after basing one of my lectures on Audre Lorde’s “The Transformation of Silence into Language and Action,” two students wrote a question to me: “There is a lot of sexual harassment in the workplace. I feel this need to break the silence, but there are consequences when it comes to sound. So, I’d like to ask you a question about how to break the silence?” I was particularly struck by this woman’s attention to sound…her question including a solution with in it…that some forms of protest might need to be silent. A second question: Sometimes the transformation of silence into language and action does harm to our own lives. How do we balance?” A question I have been asking myself: Why is white femininity so enduring, even as the government for decades supported gender equity at the state level? Femininity seems to be making a resurgence. There are whole stores devoted to various kinds of masks you can apply (and leave on overnight in some cases) to ensure that your face is clean, clear and light. Many undergraduates use umbrellas to shield their faces from the sun, even if they are walking from their dorms right around the corner to the dining hall. On the other hand, because physical education is a requirement for all undergraduates, everyone is getting regular exercise and skills on a delicious combination of sports—roller skating, jump rope, volleyball, basketball, table tennis, track and field, Tai chi, jogging, stretching. Young women are active all through the day and into the night. The track is at the center of campus and exercise is rolled into the day like meals are. I have been so struck and impressed by how well rounded their educations are. They study women’s studies as well as debate, math, economics, music, art, literature, finance, social work, design. To get to this school, they have to earn a certain score on tests they take in high school. But once they are accepted, the school is close to tuition free. Most of the students do not have to work while they are also students. They will not graduate with any debt. When it comes to education, socialism is thriving in China (with the huge caveat that you have to be able to do well on standardized tests). Access to high quality public higher education used to be possible in the US. Now it is a pipe dream. China obviously wants an educated populous at this moment. And you can even hear the results in the most popular music, sung by all young people. Incredibly high productive values, in part because the music incorporates so much training. These skills are achieved in well funded, arts-supportive education from primary school through to graduate education. There is much I can’t write about. Some of the biggest lessons, most meaningful moments, need to stay between me and those willing to share and teach. One of the biggest concepts that Chinese women keep teaching me is how to do work in a way that does not stir up too much too fast. This is not the same as complacency. It is realistic and effective. One savvy person teaches me, in Taoism, “things will develop in the opposite direction when actions become extreme.” So, find soft solutions, soft landings, ways to make change that do not cause boomerang effects. Meanwhile, a long term activist slips me a gorgeous poem she wrote after the death of political prisoner Liu Xiaobo. Several of those who mourned his death by putting their hand over their heart in public have been detained. She whispers to me that she doesn’t believe in soft solutions all of the time.